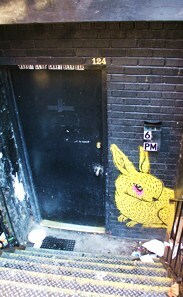 Amidst the chaos of MacDougal Street, 124 Rabbit Club can be a challenge to find. Look for #124, then walk down the stairs through the black door with a rabbit on the right. If it’s after 6pm and the door is still locked, try ringing the bell, speakeasy-style. Once inside, check out the eclectic crowd and Leipziger Gosebeer, an unusual German wheat beer with salt & coriander added for flavor. We also like the Allagash options and the unique Wells Banana Bread Beer.